Our driver, Andreas was excellent and so was the local guide, Selmir. Mostar is a terrible place to be if it is raining. The cobbles are very slick, uneven and hilly. People can and did fall. On a sunny day, Mostar is a great place filled with interesting history. We had a lovely lunch along the river and enjoyed the warm Bosnian hospitality. I feel bad giving the trip one star, because it was the fault of the weather, not the trip planners. My fear of falling, especially as I had had a fall in the last year that resulted in a broken leg, so that explains my negative reaction to the slick cobblestones. Medjugorje was a bust. it was like Disneyland for Catholics. Antiseptic and filled with shopping opportunities. Nothing felt holy or like you were in a special place. There was an uninspiring church and a town filled with Catholic souvenir shops. It was incredibly tacky. The walk up to the Blue Cross was arduous and not for anyone who is not in good shape or has a fear of falling. Again, this negativity is partly due to my personal medical history. I was also uncomfortable with some of the more extreme devotional activities of some of the pilgrims. There were some very strange behaviors. I visited on September 13, 2018 on the 7:30am excursion.This is a five-star trip to take, despite two small issues. One issue -- I was very unsure during the initial pick-up. I opted for the Hotel Park location and so many buses, taxis, vans etc. pass through going to similar destinations, that I didn't know if I was getting on the right one or not. Luckily I did, because the tour guide on the actual bus down by the port, Silvio, was fantastic. He was very knowledgable about Bosnia and Herzegovina and willing to answer any and all questions. The walking tour guide in Mostar was also awesome. She knew literally everything there was to know about the town. Mostar itself (Počitelj as well) is beautiful. Markets, beautiful architecture, people and food as far as the eye could see. Which leads me to issue number two, which is that there just wasn't enough time to properly explore Mostar. Realistically, to explore the town and outskirts, two hours isn't really enough, when you factor in a sit-down meal. I did still see a ton of sites, so not too big of a complaint.The trip to Kravice waterfalls was excellent. Swimming in the gorgeous, refreshing water there was quite the experience. It was pretty packed, but there was no issue finding space to chill.The ride there and back went very smoothly (the bus driver was a real pro on the mountains we drove over).All in all, I highly recommend this trip, but if you really want to explore Mostar, you may need a full day. Really enjoyed this trip. Beautiful location with a fascinating history. Our guides were also absolutely terrific. Only small thing I would suggest is advising people on the Medjugorje walk. When we went it had just started raining which made the climb incredibly muddy and slippery which led to very slow progress up the hill which in turn made us late for the meet up with the rest of the tour who went to the Falls. Igor and Tiho were absolutely amazing. They made the trip vastly more interesting...we laughed...we had a great time. 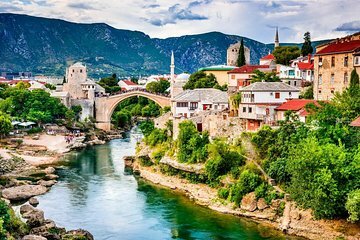 Mostar is an absolute must when visiting near by areas. It’s so beautiful with a rich and interesting history. I did the waterfalls and rented a kayak and I was so happy I did. The tour guide in Mostar was great too! Tour was very good. The guide Egor (I think) was very professional and informative, with perfect English. This trip is definitely worth doing and is value for money for all that you see. We had great time at Mostar! Mini van is comfortable and the driver is professional, trip arrangements are prefect! Niki was an amazing tour guide. Probably one of the best I've ever experienced. She was full of energy and information. It was well worth the excursion from Split.